Run by the National Park Service, Sleeping Bear Dunes National Lakeshore is one of most scenic destinations in Michigan, with miles of paths over beaches and massive dunes that tower over Lake Michigan. Here, there are plenty of options for a run to suit any mood or ability. Some of the dune trails are loose and sandy, which makes for strenuous running. 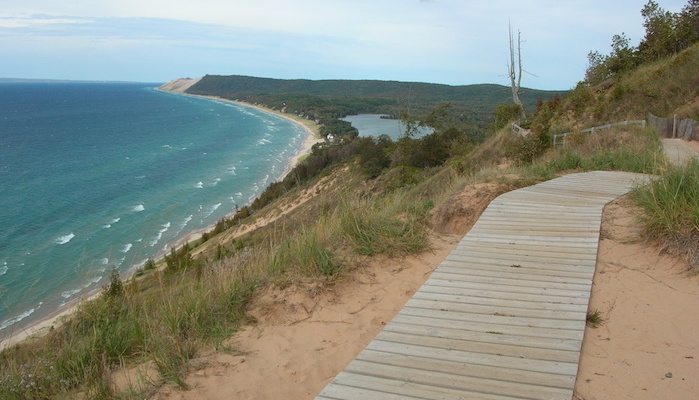 One good non-technical option is the Sleeping Bear Heritage Trail: a 20-mile combination of boardwalks, crushed limestone, and pavement which reaches from Glen Arbor to Empire. Along the way, it hits some of the main sights in the park, including Dune Climb, the Maritime Museum, historic cemetery, and Olson and Kelderhouse Farms. The ~5 miles from the Visitors Center to Dune Climb is one of the most popular sections and great for running. Another favorite section is the Empire Bluff Trail, which is 1.5 miles out and back along combination boardwalk and gravel.